I originally did not intend to go to this event, as I initially only purchased tickets for this singles’ October handshake event. But when I knew I would be in town I decided to purchase a few last-minute tickets. What I had forgotten was that the event fell on the same day as former SDN48 member Hatakeyama Chisaki’s final performance before she went on a maternity hiatus. I have not seen Chaki perform in quite a while, and I really wanted to see this event as well. But I couldn’t do both, and I already bought these tickets, so it was decided. Sorry Chaki. Everywhere I looked I saw Black Pink gear. Shirts, Oshi towels, pins, hats. 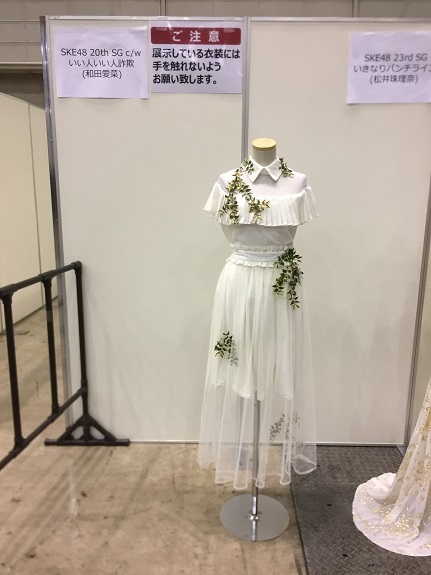 It seems like it has become something of a tradition, but whenever SKE does an event at Makuhari, there is usually a K-Pop or other foreign group also performing there. Got7, Ariana Grande, and now Black Pink. 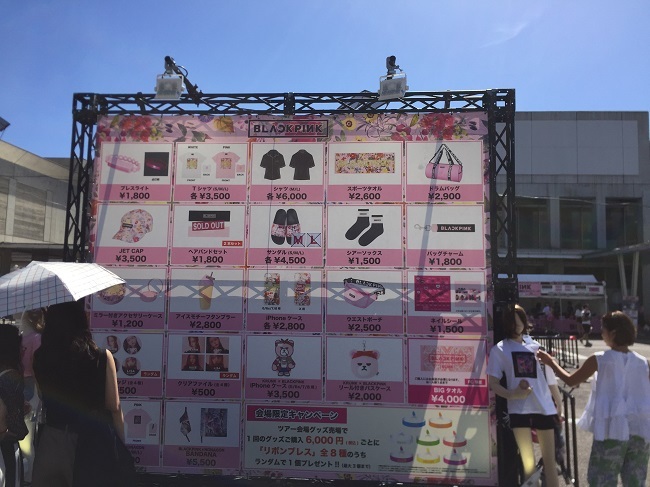 Instead of going straight to the SKE event, I sidetracked over to the other hall to check out Black Pink’s goods. Ultimately I didn’t see anything I was willing to plunk down 3000 yen for. Eventually I backtracked to Halls 10-11 for SKE. Tani Marika (Lane 16) I really wanted to see Marika today because I saw her perform in Nagoya on Monday, and wanted to give her some of my thoughts about the show. Plus, she has been slightly salty with me lately. I wanted to see if I could break that cycle. 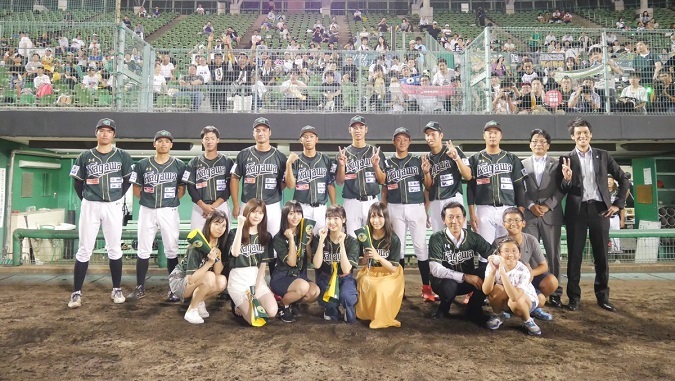 I entered her booth flashing my Team E hand sign, and she said “Team E, Yeah!” I told her that I had a lot of fun, and despite having a bad seat, I cheered for Tani the entire time. She pretty much nodded and gave me a thumbs up, and I was on my way. Matsumura Kaori (Lane 11) Kaotan’s line was longer than Tani’s. In the meantime I took my Tani ticket necklance off while I snaked the line. I noticed people were wearing a ticket necklace I had not seen before. It was then it dawned on me that this was the first Tokyo event for Ikinari Punch Line, so there would be new goods. 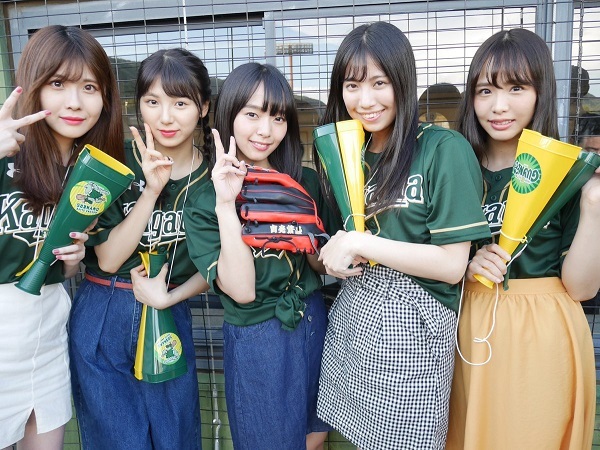 As I got closer to the front I noticed Kaotan had on the same top as Marika, a green “Kagawa” jersey. 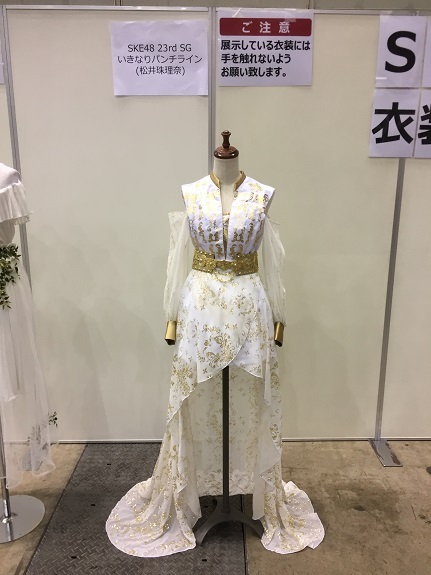 However, I merely told Kaotan it was a cute outfit, and then reported on my trip to Nagoya. When I told her I won a show she was like “But not Team KII!” She then lightly slapped my hand and told me I am supposed to come for her team. I told her next time as I got pushed out. While I waited for the next slot I purchased a new Kaotan ticket holder necklace, and then watched one of the members playing badminton with fans. Later I ran in my friend Will. We were chatting over by Tani’s lane when a fan noticed I was wearing Tani’s necklace. I ended up talking to him for a few minutes as he as interested in how I came to like Marika. Later we queued up together, and this was around the time Yuasa came out and made his announcement about the SKE48 Request Hour. He also made an announcement about Jurina, although I didn’t catch it. It seemed like he was basically thanking everyone for their concern. The funny part was that all the members were crowded behind the lanes near where Yuasa was talking, which is right were I was. I noticed a lot of the members were looking at me, LOL. Anyway, I also told Marika that I was impressed by her dancing in the show, and again I got the similar thumbs up affirmative reaction. I don’t know, Tani just seems a lot more aloof lately. I don’t know if it’s just me, or her demeanor in general. Hidaka Yuzuki (Lane 13) I only ever get tickets for Yuzuki when it is an SKE exclusive event. So I never really get into a good rhythm with her, instead always starting the conversation with the obligatory “hisashiburi” Anyway, like with Kaotan I told her I had been to Nagoya earlier in the week and saw a Team E show. 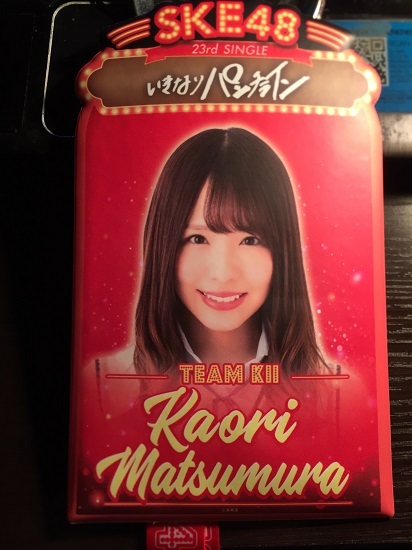 And…like with Kaotan she scolded me for not winning a Team KII show. (Like it’s sooooo easy, right?) I promised her next time I would be sure to come for KII. I have a 50/50 chance since I only ever apply for KII and E anyway. While she was still talking to me the guard tried to push me out quite hard, but she was still saying something. So I planted my feet and wouldn’t budge until she finished what she was saying. Matsumura Kaori (Lane 11) One last visit with Kaotan. This time I was wearing my new Ticket Holder, LOL. So I was telling her that after the show I was looking for good tebasaki in Nagoya, but didn’t know which restaurant was best. She initially suggested Furaibo, which I had heard of and considered going to. However I told her I hadn’t ever been there. She then suggested Yamachan, which I have been to and really like. She then asked why I didn’t go for some unagi, and somehow got the impression I don’t like unagi. I told her this wasn’t the case, but I was in the mood for tebasaki. In the meantime the guards had called time ages ago, but weren’t even trying to push me out. So she confirmed that I like Yamachan, and I then told her I also like Akakara (another Nagoya-based izakaya chain) And she was like “Yeah, you can get both of those in Tokyo!” So I guess next time I will go to Furaibo. I actually passed one near Nagoya Station, but ultimately didn’t go in. And with that I caught the JR Keiyo Line back to Tokyo. I was reading my book, and at the next stop an old friend of mine got on the train. Talk about a coincidence! My friend Suzuka actually used to occasionally work the 48-group handshake events as a check-in guard. Suzuka-chan saw me sitting there and was like “Huhhh…Why??? ?” She was like totally in shock. What are the odds you would run into to someone you know on this train in the middle of Chiba? Anyway, we chatted the whole way back to Central Tokyo, a nice end to an interesting day. And, my flu-like symptoms and general lack of strength and energy seem to be all better. Yatta!